The West Egg Mortgage Acquisition Partners Preliminary Application is a simplified form, designed is to lessen the burden of assembling and reviewing a complete, formal application package prior to having at least some assurance that the loan request, in general terms, could be favorable considered. So in the initial stage, we need only the basics. While you are free to attach any exhibits that might support the file, other than the information requested, no further documents or schedules are required. We will rely on the information submitted in making our decision to go forward, so please be as accurate and thorough as possible. Remember that our assumption is that the income and expense information provided will match what we will later document on tax returns and operating statements. If this is not the case, please make a note so that we can address any issues in the early stages of the process. You may return the assembled Preliminary Application to our office via fax, eMail, FedEx, courier, or regular mail. With the package in our hands, we'll do a cursory analysis, and if there is potential, we'll get back with estimated rates, costs, and conditions, and we'll try to detail most of the documents, additional information, and fees that would be required to go forward. We'll also follow up if there are problems or issues needing further explanation. 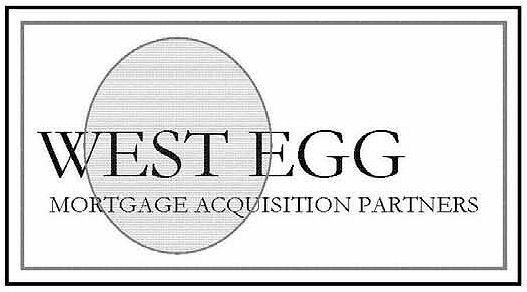 Thank you again for your interest in working with West Egg Mortgage Acquisition Partners. If you have questions or need further information, please don't hesitate to call. Please Click HERE ~ PRELIMINARY APPLICATION ~ to download the form. You'll need Adobe Acrobat Reader. If you do not have Adobe Acrobat Reader, please click here ~ ADOBE.